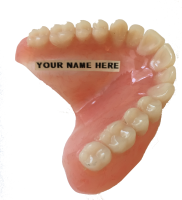 We can insert your name into your denture. This is particularly useful if you are hospitalised or in a nursing/residential home where dentures may get mixed up with others. Loss of dentures causes inconvenience and denture replacement takes time as well as the cost of a new denture. Denture naming is highly beneficial.